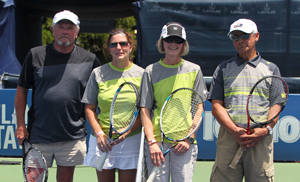 Four long-time volunteers of the BB&T Atlanta Open took Stadium Court to play a once-in-a-lifetime, doubles tiebreak Saturday. The brief competition was the main event of the Fan/Volunteer Appreciation Day presented by PGA Superstore. Volunteer Coordinator Amy Mason cited four criteria for the selection: volunteering since 2010, showing great reliability, acting as a team player and showing support for staff and leadership. Five-year volunteers Kimberly Eubank, Chris Daniel, Victor Valentin and Darrell Hester were selected by their respective team leaders to participate in the afternoon match. The volunteer’s competition followed the first doubles match at 12:30 p.m.
Before the match began, Safety Patrol volunteer Hester waited to take the court with members of his Safety Patrol team by his side, giving him encouragement and good luck. “Being chosen for this match took me by surprise. Out of all the people chosen, I don’t know how my name got in the hat,” said Hester. Patrol team members said Hester deserved to play in this match, based on his devotion to the tournament and his years of service to tennis since 1995, going back to the former pro tournament played in Johns Creek. Hester teamed with Eubank against Daniel and Valentin. Hester and Eubank, a court monitor, prevailed 7-2. Daniel is a scorekeeper and Valentin is a co-chair of the usher team. “The match was really fun. Most of the time I’m playing with an audience of 10, so it was really fun to be out there on a real court with an audience,” said Eubank. Eubank added that she enjoyed the assistance of the volunteer ball persons on court. “In my normal matches, it’s no fun chasing my own tennis balls. It was a nice change to have some one else handle it for you,” said Eubank.